Franchising and Entrepreneurship are two different business concepts that share many facets and aspects, even though they also have significant differences. This article will explore both and explain the advantages to be gained from the franchise business model. Of course, there are many different entrepreneurial models of business, but the basic structure is that the entrepreneur or group of entrepreneurs (or employees they designate) create the business concept and structure, then they and their employees execute the business plan. Entrepreneurs generally consider "being their own bosses" a major advantage of this model (more about the reality of this later). Entrepreneurs sometimes follow principles, advice and business practices taught to them by others, but they are the ones who make these decisions and create these frameworks. Many entrepreneurs are trained in business, either formally through college courses or more informally, by a family member or by growing up in the family business. Entrepreneurs must fund their own startups or find the funding with which to do so. There is a high level of risk in starting a new stand-alone business, with startups generally having a failure rate above 50% in the first 5 years. There are many possible sources of funding including bank loans, small business loans, investors, and crowdfunding, for those who can't self-fund their businesses. The difficulty many entrepreneurs have with securing funding for their businesses is that banks and investors often have stringent requirements entrepreneurs must meet before they can get funding. Personal creditworthiness is often a requirement, as well as a business model funding sources consider sound and often collateral to put down in case of a default on the loan. Even when all of these requirements are met, banks and investors can be reluctant to finance entrepreneurial endeavors because they consider them high-risk investments. Lack of financing can be a serious impediment to many entrepreneurs in our current restrictive credit environment. Even crowdfunding has its own challenges and requires a specialized skill set to be successful. When entrepreneurs can make their investment pay off, however, the profit is just that--profit. There are no ongoing fees to pay as with franchising, making the potential for profit higher under an entrepreneurship model. Entrepreneurs can also expand their businesses into multiple locations, as many as they can make profitable. Franchising shares many aspects of the entrepreneurial model. Both involve businesses that offer goods and/or services for sale, but franchises are structured with multiple locations (units) that are leased or contracted to different proprietors, who run and administer each unit or set of units, which are all still owned by the franchisor. All of the franchise units must adhere to rules and principles that enable them to function in a uniform way. For instance, you can walk into any McDonalds restaurant and be reasonably sure what kind of food you will get and what the menu will be (with some minor variations). Another similarity between franchises and entrepreneurial businesses is that the entrepreneur or franchisee is in charge of the day-to-day running of the business: hiring and supervising staff, ordering inventory, marketing the business, and keeping track of the business's financials. One major difference with the franchise model is that franchisors offer extensive training for all of the above aspects of the business. Instead of having to figure things out on your own, you get lots of help and guidance about how to run the business day-to-day. Depending on your franchise agreement, instead of having to do everything on your own, you may also get help with the financial aspects of marketing. The level of support franchisees can get from the parent company far surpasses the typical level of support an entrepreneur can depend on, extending to supply agreements, national marketing campaigns, and administrative support. It is largely because of this support from the franchisor that the franchise model is much less risky than other types of businesses, although with any type of business, there is always some level of risk. This support doesn't come without a cost, however. Franchisees pay a fee to license the franchise unit and run it, as well as yearly fees and royalties on the profits they make. Although this can sometimes limit the amount of profit a franchise can generate, franchises typically have brand name recognition and considerable market share that an entrepreneur may spend years trying to replicate, and still may not succeed. It can be difficult to predict how any business will do, but franchises have an existing track record of success that the entrepreneurial model has a hard time matching. Certain entrepreneurs have become enormously successful, of course, but just as many have failed, if not more. Probably the biggest difference between entrepreneurship and franchising is that entrepreneurs are autonomous, at least theoretically. Entrepreneurs make the decisions for their businesses without needing to follow someone else's rules and dictates the way a franchisee needs to. Or do they? Some business models give entrepreneurs this kind of autonomy - mainly sole proprietorships or corporations where one person has a clear majority of ownership. But many entrepreneurs answer to a governing board of directors, to one or more partners, or to investors who are expecting a return on their money. For many entrepreneurs, being your own boss is not the reality they may have envisioned when they started the business. As the owner, they may be assuming more than their share of the risk, but without having the power they expected to act autonomously in making decisions for the business. If you are considering licensing a franchise, the autonomy issue may be a concern. There is great attractiveness in being completely your own boss, even if your business eventually ends up in the hands of a corporate board or under the influence of other investors. There are ways to get more autonomy from a franchise. Newer franchises are less established and often have fewer rules in place. Some newer franchises are open to input from their franchisees, so you can have a bigger part in shaping the rules that franchisees must run their units under. Another way to handle the autonomy issue is to look for a franchise that is run in much the same way you would run a business. You are less likely to have an issue with the rules if they are similar to the rules you yourself would set up for your own business. In fact, joining a franchise with a similar business philosophy to your own can make it easier for you to stay accountable to following sound practices. Although franchisees are still expected to have good personal credit ratings, it is far easier for franchisees to get financing for their businesses than for entrepreneurs. Because franchisees have the backing of a large parent company with a successful track record, banks are more comfortable lending to them. And some franchise companies even have their own financing to help new franchisees get started. Franchising can mean the difference between getting the financing you need, and not being able to start your business because you lack the funds. With financing taken care of, you will be able to focus on getting the business started and take months off the startup time that you might have spent trying to convince a bank or investors to finance your venture. Suppose you want to open a restaurant. Here is the process you might go through as an entrepreneur and as a franchisee. As an entrepreneur, you would first write a detailed business plan, including the location, type of food and menu, staffing, supply costs, and financials needed to open and run the business. This business plan would help you get financing from banks or investors, which you would then need to do. As a franchisee, you would research various franchise opportunities to see if there are any that fit with your business goals and philosophy. 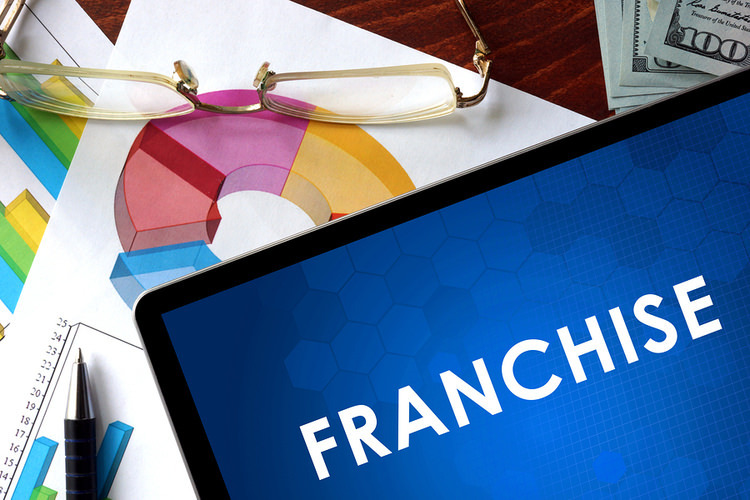 Franchise research includes looking at all aspects of the franchise business including financials, track records of existing franchises, and growth of the parent company over time. Once you decided on a franchise to license, you would still need to find an acceptable location and get financing, although financing may be available through the franchisor. The rest of the business plan has already been written by the franchisor. As an entrepreneur, you would build your restaurant, sometimes from the ground up and sometimes building out an existing building to suit your needs. You would then need to hire staff and train them before being able to open your doors. You would need to find suppliers and get the word out about your restaurant. As a franchisee, you would build your restaurant so that it looked and functioned like the other franchise units already in existence. You would be trained by the franchise company on how to run the unit, including which suppliers to use (often at a significant discount) and how to hire and train staff. Some franchisors even provide trainers from the parent company to do the actual training, freeing you up to handle other matters. The parent company would further assist your restaurant by beginning to run national advertising in your local area on television and in print media so that people would know about the opening and begin to look forward to visiting. You could still run your own local advertising and marketing to supplement this larger campaign. There are always problems that come up in the running of a business. Staff turnover, supply chain problems, and need for more customers are just a few problems that can happen soon after opening a new restaurant. Much of an entrepreneur's time can be taken up with trying to solve problems like this, and if you fail to do so, your business could fail. If you run into financial difficulties, it is up to you to find additional financing from banks or investors, which can be difficult if you are having trouble keeping up with existing payments. As a franchisee, you will get ongoing support and assistance from the franchisor and parent company to help solve the problems new businesses face. If you run into financial difficulties, you can usually get at least some additional financing from the bank or franchisor without too much difficulty. Franchisors want to see their units succeed and continue to benefit the parent company, so it's to their advantage to give you as much help and support as they can. As the restaurant operates over the years, the natural ups and downs that usually come can be moderated with help from your franchisor. Entrepreneurs have no such support available in most cases. This is the trade-off that franchisees make for not having complete autonomy over their businesses. Having support and help when things go wrong can make all the difference in the eventual success or failure of a business. The franchise system was set up to benefit all parties, both franchisors who wanted to grow their businesses and market share as well as franchisees who wanted to run a business that they could be reasonably sure would be successful. Although due diligence is always required and some franchises do fail, the franchise system has brought many different goods and services to market at lower prices and with greater reliability than entrepreneurs could ever do alone, which also benefits consumers. Indeed, franchisors themselves are some of the most successful entrepreneurs, who have figured out how to replicate successful business models all over the U.S. and the world with the help of franchisees who want the chance to run successful businesses and learn from the best. The advantages of franchising clearly eclipse other models of doing business for those interested in reducing their risks while still benefitting from a successful business. Franchise Gator offers hundreds of franchise opportunities for those who would like to run a business that has a high chance of being successful.